southern orders : SHOULD ARCHBISHOP SAMPLES BE POPE? I ASK, YOU ANSWER! SHOULD ARCHBISHOP SAMPLES BE POPE? I ASK, YOU ANSWER! 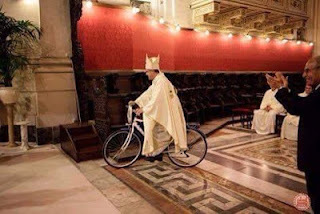 ARCHBISHOP SAMPLES WHEELING HIS WAY TO THE ALTAR AT THE PONTIFICAL MASS! UPDATE: I was not able to listen to the homily yesterday but am doing so today. It is stunning. And in the Ordinary Form, if what was said about the OF was as positive as what the Archbishop says about the EF, there would have been applause and standing ovations! But in the EF even when Archbishop Samples thanks Pope Emeritus for his foresight in giving us Summorum Pontificum there was not a peep or hint of applause from anyone! Pope Francis recently preached that the Church should be open to new things. And thus it is with a new generation of Catholics experiencing as new that which was discarded by the discarding society of Vatican II and it appears that this new generation of Catholics really loves what is new and improved to them, the Extraordinary Form of the Mass with its new Latin, new reverence, new kneeling at an altar railing to receive Holy Communion and a whole lot of other new things. Thus, we have a prophet in the Church who sees the new Mass, really the ancient form of it, as the wave of the future. His name is Archbishop Sample. Do you want to fix the mess the Church is experiencing? Then think outside of the box of the spirit of Vatican II and listen and act according to Archbishop Sample's radical exhortation. The number of reverent young people at this Mass is the Church's future! Archbishop Sample's homily begins at minute 54, second 20--worth hearing!!!!!! Holy Communion begins a hour 1, minute 35 or so, please note the reverence and youthfulness of the congregation!!!!!!! No, he's Catholic. Next question. I have to say, that if Archbishop Sample's homily had been a lecture in a meeting hall, he would have received standing ovations over his common sense talk. But in the Holy Sacrifice of the Mass, not a peep from the congregation which I am sure where applauding in their silent devotion. I have to say too, that Archbishop Samples is a clone of my thinking on the liturgy and the Church today or perhaps I should say I am a clone of him, although, sad to say, I think I am older than he! Ab. Sample is only 57--just months younger than John Paul II when elected. But he could be a candidate (along with Bp. Schneider) to succeed Pope Burke. How refreshing to hear a Catholic bishop speak like a Catholic bishop! What a remarkable difference between a Catholic bishop who actually believes in the Catholic Faith and Francis. Pope Francis is not only an embarrassment to the Catholic Church but to churchmen of all denominations. He has shown himself to be a petty intellectual lightweight who is trying to impose his own personal beliefs on the Catholic Faith. His unending snarky remarks about anyone who disagrees with him are not only beneath the office of the papacy but show an immaturity that is stunning to witness. He is unable to bear any criticism and even uses papal documents to express his intolerance and to engage in uncharitable judgemental pronouncements unheard of in Church history. Things are so bad in the the Church that we have worldwide liturgical abuse that is accepted as the norm. A worldwide collapse of the faith that is so bad that only a minority of people who identify as Catholics believe anything the Church has always taught......and most recently a pope who the whole world had been told that Hell doesn’t exist and that the soul is not eternal, and the world yawns. How can any intelligent faithful Catholic take him or his sycophant bishops seriously. Then we have Archbishop Sample. Look at the difference between him and Francis. Who sounds like a Catholic bishop, Sample or Francis. Who sounds mor like a Christian. Who sounds like a Christian gentleman. Who sounds like a mentally sound heterosexual man who doesn’t have an axe to grind against everybody and everything. Who sounds like they love the Church. I understand that we deserve to have an awful man like Francis presumably validly elected as pope because of our disobedience but how long will this punishment last. If only we had more bishops like Sample, but we don’t so the punishment would seem to be ongoing for at least another 50 years until Our Lady steps in to save everything. Listening to Sample reminds me of a time long gone when the Church had Faith. I watched this live on EWTN and was shouting yesses and exactlys and thank-yous from my living room! We need more like him! I watched this foretaste of Heaven - virtually everyone there was much younger than Kavanaugh and his crowd, most by decades. If he were intellectually honest, he would watch this and reflect on it. I was able to watch the Mass almost in it's entirety. It was amazing. I have to say AB Sample is very apt when he says that the energy behind the EF today is the younger generation. Those my age and older, who came of age in the post Vatican II era largely dismiss the EF as irrelevant and say "I get nothing out of it". The younger generation, my 2 sons and my daughter who is joining the Nashville Dominican Sisters of St Cecilia, are very drawn to the sacredness and majesty of the EF. Our Holy Father and his ilk are clinging desperately to the misguided notion that there is a before and after. Yes, I know Pope Francis uses the EF in parts but we know he is more aligned with his brother bishops from Germany than not. In some ways, if he were genuinely in favor of a hermenuetic of continuity we might be able to say that his blend of the OF and EF could be a model....could I be onto something? Perhaps, but he needs to correct himself on a lot before I would believe that. Oh well, thanks be to God for AB Sample. A Cardinal someday? Not under this Holy Father...the story goes on. I am not a fan of buskins. -- He supports the Vatican II liturgical reform. -- The Novus Ordo and TLM are two forms of the one Roman Rite. -- Is on board with the Missal of Blessed Pope Paul VI. -- He supports the notion of "mutual enrichment"...that Novus Ordo and TLM can and must serve to enrich each other. -- Is open to "further liturgical development and progress." None of the above points is acceptable to Latin Church "traditionalists." Given his support of Vatican II, Pope Blessed Paul VI's liturgical reform, and the idea that the Novus Ordo can and must "enrich" the TLM, "traditionalists" would insist that Archbishop Sample is a "modernist." But the fact is that Archbishop Sample, in line with Pope Benedict XVI, recognizes that the Novus Ordo is here to stay. In his letter that accompanied Summorum Pontificum, Pope Benedict XVI declared that "the new Missal will certainly remain the ordinary Form of the Roman Rite." Archbishop Sample is not on board with the "traditional" Catholic pipe dream that imagines the TLM replacing the Novus Ordo throughout the Latin Church. That is a pipe dream that fuels liturgical wars...that pits Latin Church Catholics against each other...that leads to separatism. Rather, in line with our own Father McDonald, Archbishop Sample, in regard to Latin Church liturgy, is realistic and a peacemaker. With Archbishop Sample, in regard to the Novus Ordo and TLM, it isn't either/or...it's both. Archbishop Sample is proof that one can support the TLM and Novus Ordo without pitting the two forms of the Roman Rite against each other. Archbishop Same has refused to fuel the Latin Church's liturgical war. Archbishop Sample and Father McDonald are peacemakers. TJM - I saw lots of young Catholics there. I see them at OF masses, too. The mass has sent shock waves throughout the NCCB offices, of all the beauty, the sermon, the vestments, rubrics, scholas, etc, the biggest thing that has utterly shocked the hierarchy is the huge crowd of young MEN present. There are not a lot of young Catholics at the typical OF Masses on Sunday. I get around to a number of parishes and the overwhelming number of folks there are middle aged and older!! Maybe they are there at Christmas and Easter, but otherwise, they are missing in action. NCCB will go bonkers because people like Sister Mary Pantsuit, in charge of "Liturgy Planning" keeps telling the bishops and clergy if we only add more gimmicks to attract young people, they will come!!! TJM - I get around more than you, I suspect, and I see young people at all of the OF masses I attend. No one denies that there are lots of young Catholics at the OF Masses. The question I would ask is about their proportion of the congregation, and most importantly, do they stay as they grow older. I think it is in these 2 areas that you see an important difference between the 2 forms of liturgy. Some of us don't have choice as to what type of Mass we get to attend. I don't go to the OF Mass at my parish because it is my preference. I teach PRE and want to be able to continue in that role. If the EF were available in my parish, that is the Mass I would choose to attend. I think we should be provided that choice. . .
Victor, TJM denies it. His words, "There are not a lot of young Catholics at the typical OF Masses on Sunday." Inasmuch as Summorum Pontificum is only 11 years old, I don't think we know if the young people attracted to the EF will stay as they grow older. I just think that data isn't available yet. Then, the tougher question to answer is, "Is it the form of the mass that 1) draws them in and, 2) if they stay, is it the form of the mass that keep them there? The law of prayer is the law of belief. Of the young, old and in between who hear Mass exclusively in the EF, there is more reverence, a clearer understanding of creature hood before the Creator, a sense of sin and unworthiness rather than haughty entitlement, The laity are equal in their actual participation and have no problem with the Church praying on their behalf as they remain docile to Hod’s action on the Loturhy. God’s sction in their lives! I was at the Mass. There was no chatter going on between people and some waited a long time because many early arrivals were in place at 11 AM and the Mass started about 1:15 PM. The Credo was chanted by the congregation along with the choirs. This was very impressive and evoked a sense of unity among us that I have never experienced at OF Masses before. Thanks for promoting me as an authority. You are being incredibly dishonest if you believe the numbers of young people at the OF today even faintly approaches what it was before Vatican Disaster II or even 20 years ago. My territorial parish has a large grade school. When I am unable to make the EF at another parish, I go there, and behold, not more than 10% of the Sunday flock are people under the age of 21. In the old days, it would have been triple or quadruple that number. I know you're invested in failure. If that gets you through to the nursing home, so be it. I cannot speak for TJM, but I understood what he said in terms of proportion of the congregation. Obviously the OF is the norm and the vast majority of Catholics attend it. In that sense you can say "lots of". But proportionately, that is a different story. I sometimes wonder if the only role left for the Church in Western countries will be to eventually convert their Novus Ordo Church property into old folks' homes. I say this, with all due respect, from first hand experience. All around me NO churches are closing, some being converted to condos, and what a sad sight that is. The Church has failed to teach people about God just as much as it has failed to retain those it has taught about Him. Recently, for 20 years of my life, I was part of a NO church out of necessity. Being liberated from that necessity I was able to see the difference with an EF church. As FR McD notes, you see it in the reverence. The blablablah fundamental to a NO liturgy (i.e. noise) works against this reverence that underlies a communion with God. The EF church has been growing fast particularly with young people under 40 with plenty of children (like the good old days), while the NO church was failing to retain its youth and basically was dying for 20 years, even though it was a fairly typical middle of the road kind of church where people hated Latin. You do not need more than 11 years of Summorum Pontificum to realise what is happening. The EF Mass speaks to the hearts of the people not relying on words only, while the NO church does not speak to their hearts but with its noisy words that are meant to address only their intellects. TJM - I don't promote you as anything. I simply quoted your words in response to Victor. You said "There are not a lot of young Catholics at the typical OF Masses on Sunday." There's nothing at all dishonest in quoting your words. The evidence is there. Your argument is that the OF has driven away people with their children. I suggest this is not true. No, I will not post evidence for my position unless and until you have posted evidence for yours and we have discussed it at length. Because it does not fit with your preconceived narrative, you cannot acknowledge that the decline is largely due to simple demographics. There are fewer children in families these days. The evidence is readily available - you can look it up for yourself. Victor, You say, "You do not need more than 11 years of Summorum Pontificum to realise what is happening." Yes, you do. A 2 year old who started attending with his/her family 11 years ago (or more recently) is still going with his/her family. That's not retention. They have no choice. I don't think much can be said about "retention" for another 20 or 30 years. Mike's parish has over 800 families, and his parish's K-8 school has approximately 200 students. That school is roughly the same size as the school attached to my parish of roughly 200 families. Unsurprisingly, we had more people confirmed this year than in Mike's parish that is 4 times larger. According to the most recent statistics, in the USA, the SSPX has 103 chapels with roughly 25,000 people. They have 85 priests and 1 bishop. There are 40 religious specifically in the SSPX, not counting the attached Franciscans, Dominicans, Carmelites, and Benedictines. There are currently 71 seminarians in the Virginia seminary. Mike's diocese has 79 parishes with roughly 77,000 people. They have 88 active priests and 2 bishops, 82 religious, and 19 seminarians. I will admit that it is not the "form" of the Mass that is causing these numbers, but the adherence to Catholic faith will all its accompanying familial and social constructs. Well said. Here in Chicago, an historic Catholic Church closed and will be converted to a cultural center. Ironically, this Church is in the very heart of a large Hispanic section of Chicago, most of whom would be at least nominally Catholic. Our Archbishop will claim everyone has gone to the suburbs is the reason for parishes closing. But this particular parish undermines that rationale. The people are there but the Church has not made a compelling case for these Catholics to come. An authentic reception and implementation of Summorum Pontificum eschews the petulant polarisation and endless comparisons of the two forms. Pope Benedict's moto propio calls for a 'mutual enrichment' of both usages of the Roman Rite. LOL, Kavanaugh, keep living in your fantasy world that the Church is in the midst of a "New Springtime" via the OF. And keep dodging John Nolan, Bee, and myself when we ask for your studies, evidence, etc. "There are fewer children in families these days." And those who believe what their eyes see, know that a large majority of families with 4, 6, or 8 children are attending EF Masses. At least, that's what my eyes see--I virtually never attend an EF Mass without seeing several such families, while in attending literally thousands (counting weekdays as well as Sundays) of OF Masses over a 40-year period in numerous parishes, dioceses, and states, I've seldom if ever seen several such families at a single one. Speaking of large families, I listened to a clip of the Washington Correspondent Dinner's "entertainer," Michelle Wolf, who condemned Vice President Pence for being "anti-choice." She said "don't knock an abortion until you try it." That's Kavanaugh's party, the Abortion Party, formerly, the Democratic Party. I hope he is proud of himself. Regarding your comment at 12:21 PM, I've heard this before in different, yet similar ways. I'm curious about this need for the EF to prove itself. It would seem, given its age, that it has already done so given the number of priests and saints created over the years. Young adults who are starting to identify preferences in life will probably continue on with the EF should it be available wherever life takes them. But, what if it also causes a younger person to stay within the Church and attend a NO parish (for lack of an EF option) should they relocate for work or, some other milestone? Hasn't it done its job and done it well if this scenario were to happen? As mentioned in Abp Sample's homily, the EF has a significant role in terms of helping the Church to reconcile itself to its past and recognize its past in its present. To me, proving itself via metrics isn't part of that role. Would you please comment? Byz - The current discussion is about young people who attend the EF today, not those who attended in the past. The assertion was made that the EF mass attracts and holds young people today. If ALL the other cultural circumstances today were the same as they were in the past, your argument that the EF mass has already "proved itself" would have merit. But those circumstances - cultural, sociological, economic, etc. - are not the same and, I would suggest, never will be the same. Will some young EF attendees stay in the Church? Sure. And there are those who attend the OF today who will still be in the pews 50 years from now? Sure. But only time will tell. Thank you for your response. I wasn't trying to derail the discussion so much as just understand the need to quantify for the EF that which does not seem to be quantified for the OF. One observation: I was impressed with the young men (clearly non-ordained) vested in cassock, surplice and cope. How better to help guide vocations than to put it right in someone's hands by vesting in that which is worn by priests. This, to me, seems more impactful than the usual ill-fitting albs and yarn cinctures you see at most parishes being worn by both male and female servers. I know, I know, Anonymous, it shouldn't matter and, I know, I know, Anonymous, priests also vest in albs but, this seems like a more powerful method of engagement for those whose spirituality etc. is still developing. I'm sure those young men were happy to be there and they will remember the experience as they wouldn't have given of their time if it were not attractive to do so. Don't miss that Archbishop Sample has taken some tremendous risks, both in this Mass in particular, but also in his liturgical agenda overall. In the current environment, there is no question. Hopefully, he and others who have stepped out publicly aren't penalized as a result. I live in Portland in Oregon, and have to say that I have been disappointed that Mons Sample hasn't mandated more 'traditionalizing' changes in his reign-- but of course am not privy to his discussions with the clergy. Our parish priest began, at a certain point... two years ago? perhaps, to say the prayers after Mass (to St Michael etc), kneeling, at daily Masses; it's possible that he felt able to do this because of encouragement from Portland. Mons Sample did, however, just reverse his predecessor's requirement that we all stand from the Agnus Dei to until everyone has received Holy Communion-- I gather that 'we were all of us together as a community engaging in the Communion Procession' and it was judged to be rude for some of us to kneel while others were still processing; such nonsense-- so that we will return, from Corpus Christi onward, to kneeling from the Agnus Dei until the priest returns to his chair. Am grateful for even small steps, as much as I had been hoping for more sweeping changes when I first heard of Mons Sample's appointment. JUST ANOTHER DAY IN THE NEIGHBORHOOD! IT'S APRIL 24th AND NO RAPTURE! HOLY COMMUNION ON DEMAND, FAST FOOD STYLE! HOW CAN WE MAKE INTINCTION THE NORM? FASCINATING NET FLIX TWISTS AND TURNS! JUST HOW INTERESTING IS THIS? WHOA! AT LEAST SOMEONE IS CATCHING HELL! WHAT INTERESTING PAPAL TIMES WE LIVE IN! TECHNICAL PROBLEMS WITH BLOGGER REPAIRED!